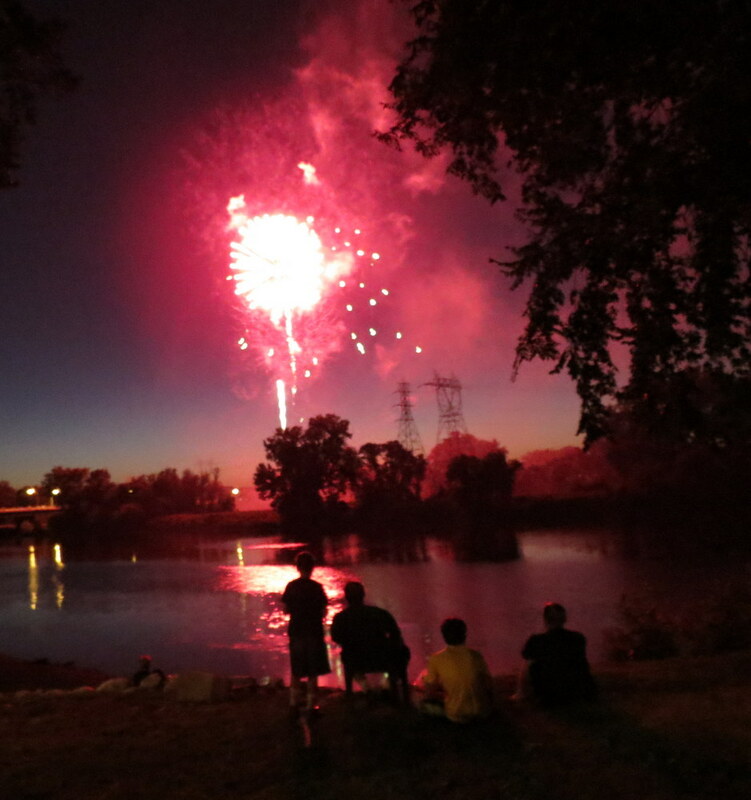 Nonetheless, a new tradition was apparently started on July 3 and 4, 2017, with fireworks displays sponsored by Rivers Casino at Mohawk Harbor. 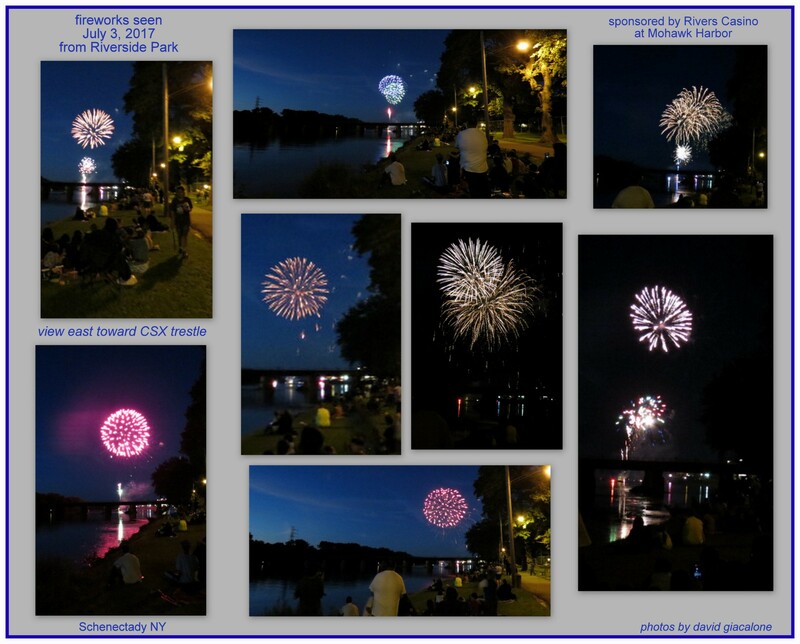 Folks came to Riverside Park in the Stockade to see the Rivers Casino fireworks, and by facing east, toward the CSX train trestle, they were able to enjoy a very good view of excellent fireworks [photo at right taken while waiting for the show to start on July 3]. I was not able to be in the audience for the big show on July 4th, but did see the July 3 “teaser”, and had a good time. 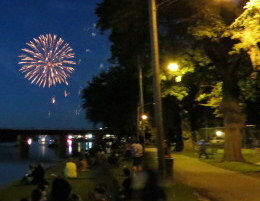 Thanks go out to Rivers Casino at Mohawk Harbor for bringing its fireworks flare to Schenectady. I’d like to suggest, nonetheless, that Rush Street consider instead holding its Schenectady fireworks extravaganza at a time of year when we have fewer fireworks shows available. In Philadelphia, for example, they put on a New Year’s fireworks show at their SugarHouse Casino. Due to extenuating circumstances we have decided to cancel our fireworks show for the 2017 season. It was a difficult decision to make. We love fireworks, and the huge crowd that joins us to watch them! Our ski team has numerous events and shows scheduled off site in the following weeks, and we don’t want to exclude them from our fireworks festivities. Also, scheduling conflicts with parking availability in Collins Park on the July 22nd date have been brought to our attention. Other groups have time and space reserved, and our event would (hopefully) draw a large crowd that would infringe upon their events. In addition, many members of our crew are college students who will be returning to school before the end of our season. Without their help, we would be unable to serve our customers to the best of our ability. We hope you will continue to support our US waterski show team every Tuesday night at 7pm. Next time you visit, please be sure to pick up a copy of the Freedom Park summer concert schedule, or visit freedomparkscotia.org. Ski shows and concerts are completely free. Thank you to the village of Scotia, and all of the 1st responders, fire dept. , and police dept. for your help keeping our event safe for everyone. We couldn’t do it without you. Please have a safe and happy 4th of July, and a wonderful summer.